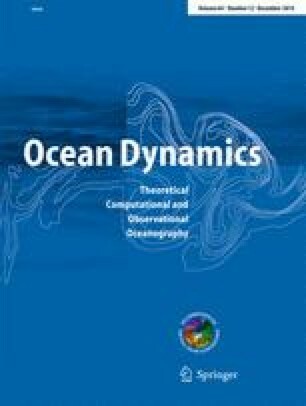 This study formed a portion of the Ph.D. dissertation of LL at Scripps Institution of Oceanography. Funding was provided by National Science Foundation grants OCE-0960770, OCE-1419306, and ARC-1107795. JLM was supported by the US Department of Energy’s Office of Biological and Environmental Research in the Office of Science as part of a project named “Ultra High Resolution Global Climate Simulation to Explore and Quantify Predictive Skill for Climate Means, Variability and Extremes” and DOE DE-FG0205ER64119. The SIO Department generously provided salary support for LL during her final year at Scripps. The ocean/sea-ice simulation was conducted using computer resources (Yellowstone; ark:/85065/d7wd3xhc) provided by the Climate Simulation Laboratory at NCAR’s Computational and Information Systems Laboratory, sponsored by the National Science Foundation and other agencies. Computer resources were also provided by the National Energy Research Scientific Computing Center, which is supported by the Office of Science of the US Department of Energy. Caroline Papadopoulos (SIO) carried out the ocean sea ice simulation. Elena Yulaeva (SIO) is thanked for extracting the Bering Sea ocean and sea-ice model fields and transferring them from the NSF computing facility at Yellowstone to SIO.